Now day google patched the android device Security because Security is now a major concern. Because after stolen, locked device you can unlock device just doing hard reset from recovery but it’s no more. Because Google introduced a new security measure in android 5.0 and 6.0 Android lollipopand Android marshmallow called factory reset protection (FRP). Factory reset protection keeps your data safe in case your device gets stolen. Factory reset protection protects your device after hard reset the device so anyone can’t use if the device was stolen. 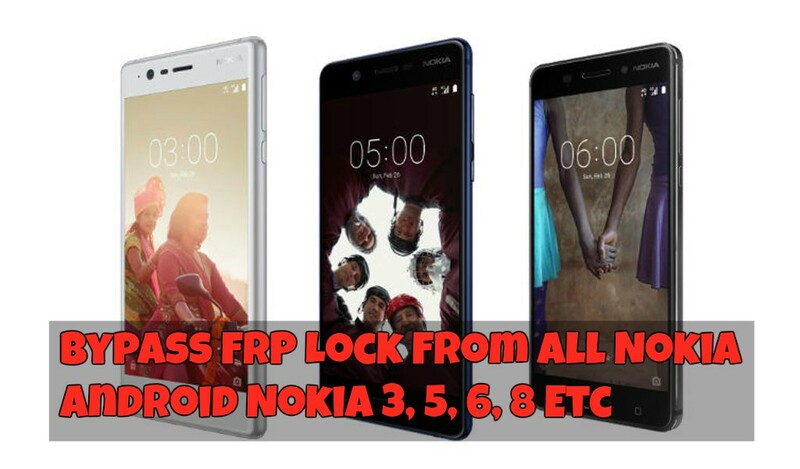 But here a method for Nokia 3, 5, 6, 8 you can bypass (FRP) Factory reset protection Google Account Verification and reset your device. Here we will guide you. HMD Global is all set to launch its Nokia 3, 5, and 6 Android smartphones in India and the expected date is June 13. On Friday, HMD Global which launched Nokia 3310 in India last month started sending out the press invites for a Nokia event in India. HMD Global launched the Nokia 3, Nokia 5, and Nokia 6 Android smartphones globally at MWC 2017 in Barcelona earlier this year. While we await confirmation on the date of release, here are the specifications and approximate price range of the three phones. Nokia 6 has a 5.5-inch full-HD screen with 2.5D design and Gorilla Glass protection, and a fingerprint sensor below the display. The smartphone was priced at EUR 229 (approximately Rs. 16,000) and runs Android 7.0 Nougat. It is powered by Snapdragon 430 SoC, packs 3GB RAM, features 32GB internal storage, comes with microSD card support up to 128GB, and houses a 3000mAh battery. The phone comes with a 16-megapixel rear sensor, while the front camera’s resolution is 8-megapixel. There’s also a Nokia 6 Arte Black special edition model with glossy black body, 64GB built-in storage, and 4GB RAM. Nokia 5 comes with a 5.2-inch HD screen and Android 7.1.1 Nougat operating system. It is powered by the Snapdragon 430 SoC coupled with 2GB RAM, and comes with 16GB inbuilt storage. It was priced by the company at EUR 189 (about Rs. 13,250). Nokia 5 has a 13-megapixel unit on the back and 8-megapixel unit in front. Other features of the smartphone include Micro-USB 2.0, NFC, 3000mAh battery, and 4G LTE support. This phone comes with a fingerprint sensor. Required Windows 10 Windows 7 Pc and Wifi Connection .